Immediate Dentures: these are constructed before your teeth are extracted and are inserted the same day your teeth are extracted. Immediate dentures allow you to continue to eat, smile and return to work more promptly. They also protect the oral tissue, minimize bleeding and promote healing. The downside of immediate dentures are that you will not be able to view the appearance or try in your new denture prior to insertion. As a result the fit may not be as accurate as post-immediate dentures. Post-Immediate Dentures: these are constructed after your natural teeth are removed and your gums have had a chance to heal enough to take impressions. The problem with this is that you will be without teeth for at least two weeks and it is important to note that the longer you wait before taking the first impression the better the result. Post-immediate dentures are made using accurate measurements and you are able to try them in before completion. This will increase your satisfaction with the final product. Note: There can be a long period of healing and changing after extractions are done. It will be necessary to visit your Denturist regularly during this time. The Denturist may have to do adjustments and add temporary liners to your dentures so as not to seriously harm the tissues and bones in your mouth. A removable partial denture replaces single or multiple natural teeth. It can be attached to teeth with clasps or crowns and precision attachments. 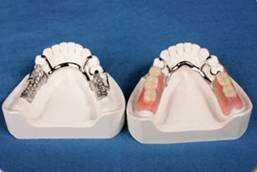 Partial dentures can have a metal framework, resin base or they can be made with a Valplast flexible resin. A partial denture that fills in the space created by missing teeth is essential for many reasons. It can help you to chew food properly, improve speech, give you lip and cheek support, and prevent your remaining teeth from changing position by drifting into the surrounding spaces. Partial dentures can greatly improve your appearance if you are missing front teeth. It is vital to restore the mouth to its original state. If you are currently wearing a full upper denture and are missing some lower natural teeth you would have great success using a lower partial denture. Upper dentures that are not supported by lower teeth can cause many problems. This will result in a poor fitting upper denture causing an increase in bone loss, tissue growth and ‘sore spots’. Will it take long to adjust to wearing a partial denture? A new partial will feel strange and bulky at first. However your mouth will become accustomed to wearing it. Inserting and removing the denture will require practice. Follow all instructions given by your Denturist as dentures which are forced into position by biting down could bend or break. Partials do require regular check-ups for maintenance. Your mouth changes over time, bone and gum ridges can recede resulting in a loose-fitting denture. Partial dentures that fit poorly should be adjusted by a Denturist as loose partial dentures can cause sores, or damage the natural teeth. See your Denturist promptly if your partial becomes loose. Flexible Partials are a quality premium product that offers the benefits of superior esthetics, comfort, function and bio-compatibility. These dentures have no metal clasps, the translucent materials blend naturally with the tissue and teeth shades. If you have an aversion to metals, then this may be the product for you. If you would like to schedule a free consultation about complete or partial dentures, contact us today!